Home / Entertainment News / See the teenage Pregnancy prevalence rate in different counties, Wanaume kazi ni kulala na watoto wa shule(FULL LIST). 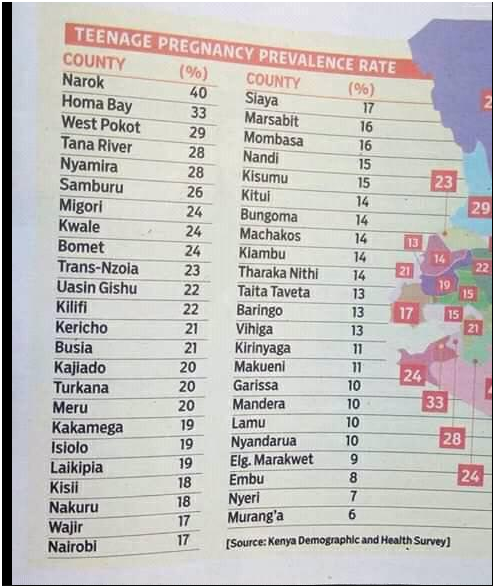 See the teenage Pregnancy prevalence rate in different counties, Wanaume kazi ni kulala na watoto wa shule(FULL LIST). Thursday, November 8, 2018-The high rate of teenage pregnancies in Kenya is alarming. When students were sitting for this year’s KCPE, a lot of girls were pregnant. Narok, Homabay, West Pokot, Tana River and Nyamira are among the Counties leading in teenage pregnancies. Ni kupanua mapaja tu mikwaju iingie badala ya masomo!